I was pleased to see my article on dried flowers in the June edition (issue 8) of Make and Craft magazine. It explains why dried flowers are becoming popular once again. I have reproduced a copy below. One very good example is dried lavender bags. We sell tonnes of dried lavender every year to crafts people all over the country. Lavender has a huge retro appeal, as nearly everyone has a granny or aunt that used to use it. It is inexpensive – even more so if you have a few of your own plants! Its relaxing aromatherapy properties are well known, and it also creates a clean laundry-fresh scent, as well as deterring insects such as moths. Many of the crafters we are in touch with sew their own lavender bags to make into gifts, or sell them at market stalls or online. It’s not all just about lavender. There is a much more vibrant selection of dried flowers and petals available now than even five years ago – primarily driven by the wedding industry. Wedding venues prefer natural biodegradable confetti, and dried petals such as roses, delphiniums or hydrangeas fit the bill. Being available in almost an infinite range of colour combinations, they can be blended to fit any colour scheme, and are an inexpensive way to add a touch of glamour to a wedding. The theme is quite often continued by sprinkling dried petals on the tables at the reception, or with dried flower table centres or favours. Additionally, there has been increased interest in dried flowers as a bridal bouquet. We provided flowers for a photo shoot this year in which a £4.99 bunch of lavender was used very effectively as the bridal bouquet, and I have had various ladies contacting me for inexpensive (£35 or less) mixed flower bunches for this purpose. Influential bridal blogs are starting to promote dried flowers as a real alternative to traditional wedding flowers. And even brides who go the fresh flower route, are now able to send their bouquet away to be freeze dried after the event as a memento. Bridal bouquet – this is a special order I hand-tied, comprising dried lavender, delphiniums & wheat. Similar bouquets are now available to buy from our shop. Adding to the good news is the fact that many more of these flowers are being grown in the UK as farmers try out new ways to diversify their business. For example, the large market for delphinium petal confetti was started in the UK by one such arable farmer. Lavender fields are also a much more common sight than they have been in recent times, although lavender growing was a thriving industry in Britain in the Victorian era, particularly in the outskirts of London. Lavender loves a warm dry climate, and with global warming, once-famous English lavender is set to compete with its French rivals again. And I have this year for the first time been able to source a new and competitive British supplier for delphinium bunches and grasses, which I previously had to import from Europe. The grower is a dried flower specialist that gave up growing their own in the mid-1990’s due to lack of public interest and competition from cheap imports – they have just re-launched their home grown range once more thanks to popular demand. The range of flowers available these days is vast. For example freeze dried petals look almost exactly like their fresh alternative but can be stored and don’t wilt. Traditional drying techniques like air drying are still widely used, alongside more recent methods such as preserving with glycerine. This method leads to a flower which is soft to the touch and can be subtly artificially coloured if required, which is useful where a particular flower colour is not available to fit a colour scheme. These days the term “dried flowers” incorporates a whole range of natural products including fruits, spices and leaves, as well as petals, flower heads and bunches. The increasing popularity of dried flowers has spread across into other handmade craft items such as potpourri. Potpourri benefits from every feature I listed at the start of this article: it is natural, using leaves and petals, and its aromatherapy properties can come from the choice of flowers or herbs, or added by using uplifting essential oils. Potpourri can either be simply handmade at home, or bought inexpensively online or from craft markets. It is a retro treat which is back with a vengeance. Some of the mass produced potpourri these days can also be surprisingly up to date, although this often uses synthetic fragrance oils, and so lacks some of the aromatherapeutic properties of its artisan cousins. For example Claremont & May branded home fragrance is a range which in my opinion has truly moved with the times. Then there are all the other crafts incorporating dried flowers, such as making bath bombs and bath salts, handstitched scented pouches and sachets, pressed flower cards, and home décor. Culinary uses are on the up too, with handmade crystallised flowers being an increasingly popular way to embellish cupcakes; freeze dried rose petals decorating wedding cakes, and even lavender in cocktails! Visit your local tea room and you may well be offered whole dried chamomile, rose buds or lavender in your teapot. 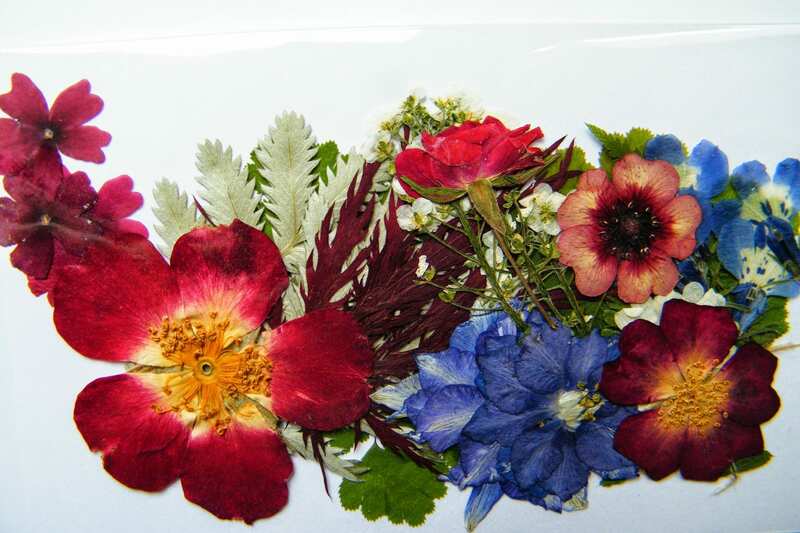 Pressed flowers – these are very popular in our shop for card making. We buy them from a lady who presses them from her own garden. If you’re still not convinced, why not check out Pinterest.com. It is awash with images of dried flowers as home decorations. In particular, dried hydrangea heads can be very effective just as a single stem or grouped in a large vase, and there are many pictures on Pinterest where they have been incorporated into door wreaths or garlands. Many people have a hydrangea bush in their garden, so they are popular to dry at home, and the range of antique shades they produce is exquisite. 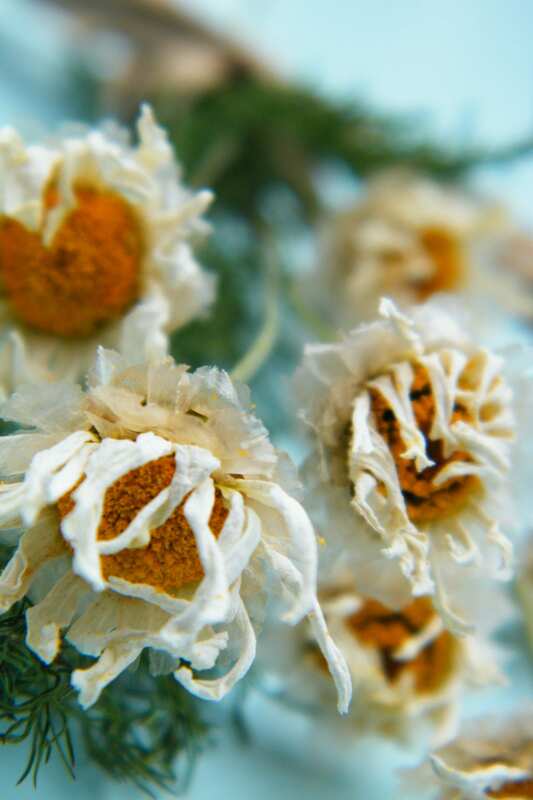 Dried daisies – some marguerites I air dried from my garden. I own a dried flowers business, but also dried flower crafts are a hobby of mine. I enjoy doing “makes” for our shop email newsletter and started a blog earlier this year. I have accumulated various recipes and tips in the last few years which I love to pass on. This is a lovely craft magazine with plenty of makes in every issue. It is published monthly and available to buy in print or digital format. Visit makeandcraft.com to subscribe or view sample pages.